Oh my! It’s so cold in Granada in the winter! The closing weeks of 2016 have been a series of tragic, comic and downright irritating incidents that got in the way of constant working. Funerals tend to come in clusters and they did in the closing weeks. But despite all this and the viruses that I pick up commuting to Spain I got though it. Worthing has been balmy with sunshine and this has helped the thought processes for the works for 2017. And we have also seen our extraordinary Jess complete two years of painting for her forthcoming exhibition in February reach its climax. 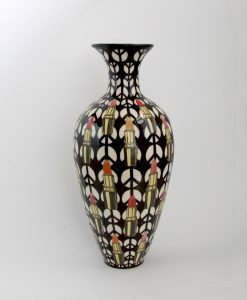 I finished a vase at the end of the year which I hope to submit for The Woman’s Hour Craft Prize and V&A initiative. The Craft prize 2017 aims to find and celebrate the most innovative and exciting craft practitioner/s or designer-maker/s resident in the UK today. My intention was to make this vase as a maquette for the second, bigger version and a way of addressing some of the tricky mathematics that I have encountered in this design. So I have made a start on the next one, but the conditions (freezing) are not great back on the old workbench. The longevity of the Lipstick idea which has been occupying my mind is clearly going to be enduring. I still have much to make and say on this subject, I still need a venue for the ‘Lipstick Tablets’. 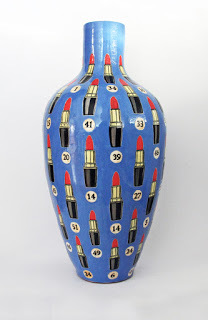 The very big blue vase ‘Painting by Numbers’ was sold at the close of last year pictured below. Seeing this one go left me feeling that I need to develop this work on the numbers, names and colours and these elements will form the basis of the current vase. I continue to be intrigued by the names lipsticks are given. The labels lipsticks were given in the past are absolutely priceless and present day naming is also another social article yet to be written. What I have discovered is that combining colour with a name (and a number) makes it do things. Add a verb to describe a colour or put it at some location where it assumed an activity, like ‘Cinema Pink’ number 67 for example (Estee Lauder, discontinued) a case of colour in action, or getting some action! I wonder what Revlon was thinking of when they named ‘Fatal Apple’ number 230 which is a red as Snow Whites’ rosebud lips and still a current colour. This just goes to show that a name can be a reason for its longevity. Queen Elizabeths lipstick is a soft red-cobalt hue and was coined “The Balmoral,” probably made by Elizabeth Arden as this brand holds a royal warrant. 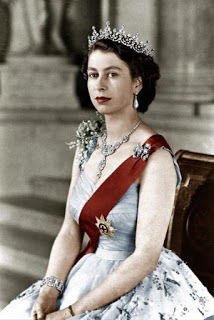 It was commissioned specially for her coronation in 1952. Finally, I find this very interesting and proof of the psychological effect of lipstick, for duration of the Second World War, all cosmetic products were rationed in the United Kingdom, however, there was one exception, yes you guessed, the lipstick! Winston Churchill declared that lipsticks would be kept in production as he thought that would have a positive effect on the morale of the English people! Lipstick sales went to an all-time high during the war!